When it comes to souvenirs, there’s nothing scarier than those silver tourist teaspoons with a picture on the end… Put those away quietly and take out something still very Australian and much more beautiful: an Alperstein Travel Bag. 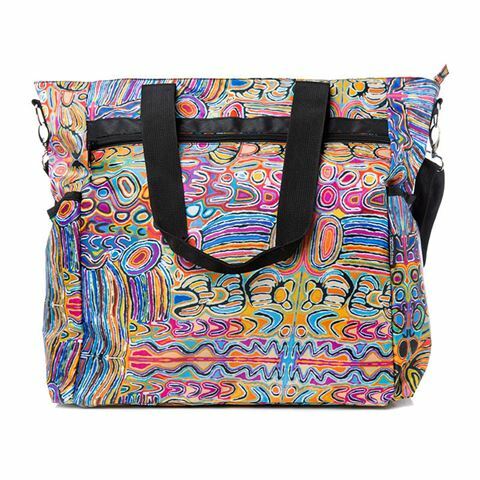 Made from polyester, this stylish bag is decorated with a beautiful artwork by the talented Aboriginal artist Judy Watson. It's a powerful way to bring art to life. Two black handles and matching removable and adjustable shoulder strap. Features two external zippered pockets. Spacious main compartment with a zippered pocket and two open pouch pockets. Royalties from this product directly benefit the artists and their community. Dimensions: 35cm (w) x 40cm (l) x 17cm (d).